The ensemble takes one last stand before the audience. Leah Andelsmith Photos. Wonder Woman and Starfire squared off on stage. The superheroes circled each other, issuing taunts that were more like dance steps. The characters launched into choreographed high kicks and leg sweeps, lip-synching to Beyoncé’s “Run the World (Girls).” When the fight ended in twin dips—also known as death drops, with each performer jumping into the air and landing in a half split— the crowd erupted in applause. Saturday, these dueling superheroes were one of the highlights of New Haven’s first annual We the Heroes Ball at Lyric Hall, a variety show and fundraiser for the New Haven Pride Center. By the end of the night the event had raised $957 for the organization. 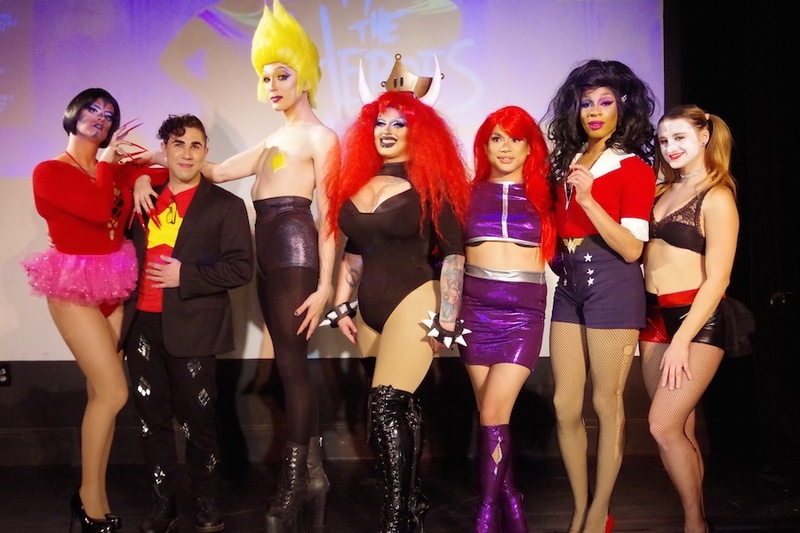 In addition to Wonder Woman and Starfire—Connecticut drag queens Robin Fierce and Hazel Berry— acts included burlesque dancer Kendall Marie and drag queens Mia E Z’Lay, Hazel Tart, and Kiki Lucia. While ticket sales made up the bulk of proceeds, Akira also raffled off four prize bundles during the evening and collaborated with Strange Ways to design a pin to sell at the ball. 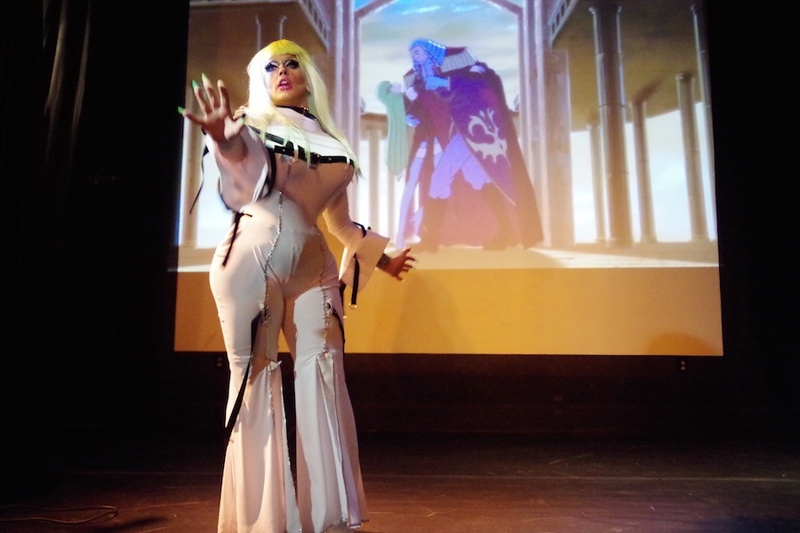 We the Heroes Ball was organized by by West Haven singer Akira, who came up in the Connecticut queer performance scene under the wing of the late Sassie Saltimboca. Akira said the seed for the Ball was inspired by Saltimboca’s Vaudeville Frolics at Bridgeport’s Bijou Theatre. The artist didn’t feel that queer culture was being fully represented at the New York Comic Con (NYCC) festival, and set out to change that with Saltimboca’s help. The pair planned to host the first We the Heroes Ball as part of NYCC 2015. But by that time, Saltimboca was losing a battle with cancer, from which she died in August of that year. Akira pressed on to spearhead the project a year later in New York, bringing it to New Haven after three successful runs in the city. Each time, he has thrown it as a fundraiser, raising over $1,000 for New York’s Trinity Shelter over multiple years. Throughout the evening, performers gave back too, none of them taking so much as a dime from the show. 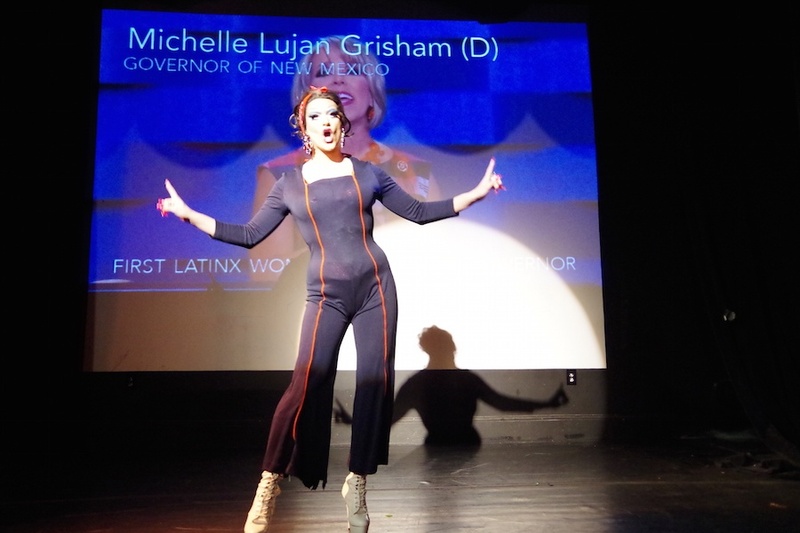 Kiki Lucia–the drag persona of NHPC Director Patrick Dunn— took the stage as Rosie the Riveter, sporting a jumpsuit and red bandana, and flexing her arm to the cheers of the crowd. Lucia lip-synched to Christina Aguilera and Demi Lovato’s “Fall in Line,” closing her eyes and leaning into the words. I wasn't made to fall in line. Behind Lucia, a slideshow displayed women elected in 2018, including Sharice Davids, the first Native American woman elected to Congress, and Jahana Hayes, the first Black woman to represent Connecticut in Congress. Lucia performed every note of Aguilera’s passionate song, the intensity helping her to pay tribute to these real-life political heroes. She blew a kiss to the audience before leaving the stage to thunderous applause. A parade of superheroes followed. 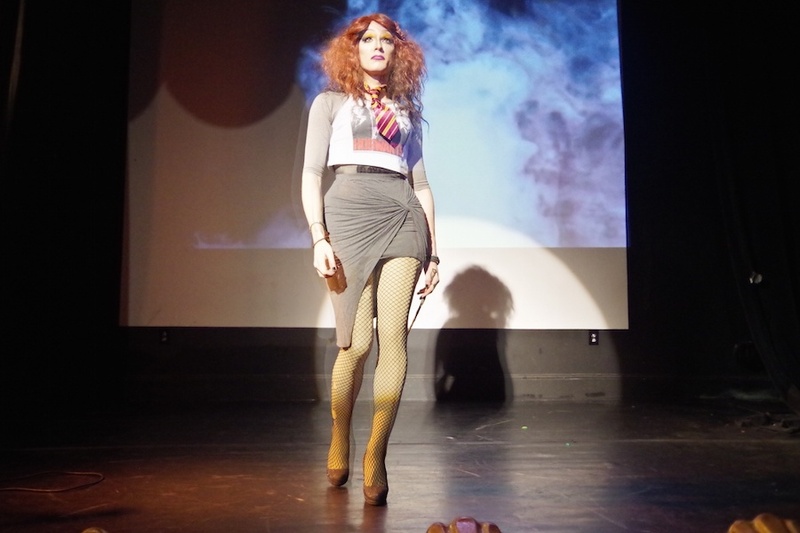 Hazel Tart made her way through the audience as Hermione Granger (pictured above). Dressed in a tiny Hogwarts t-shirt, mini-skirt, fishnet tights and a tie in Gryffindor’s house colors, she wore a frizzy red wig and wielded a slender, wooden wand. Lip-synching to Selena Gomez’s “Tell Me Something I Don’t Know” interspersed with clips from the audio book version of Harry Potter and the Philosopher’s Stone, Tart fired off spells like Wingardium Leviosa and Occulus Reparo, the latter directed at members of the audience wearing glasses. Tart highlighted moments in the book when Hermione Granger is put down, such as when she is called a “filthy mudblood” or “an insufferable know-it-all.” At each instance, the song’s hook chimed in, “Tell me something I don’t know,” as Tart confidently brushed herself off and fought back, wand always at the ready. The performance read as an empowering anthem for women and for the queer community. 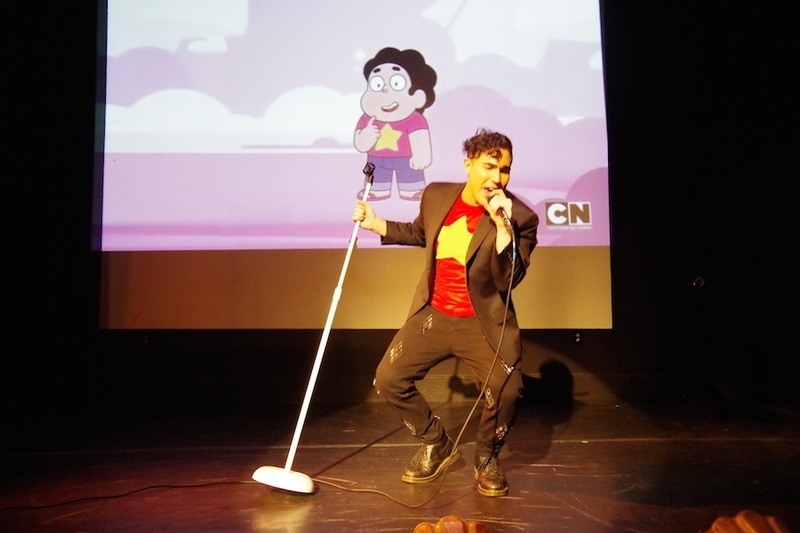 For her solo performance, Fierce portrayed the character Garnet from the Cartoon Network animated series Steven Universe. 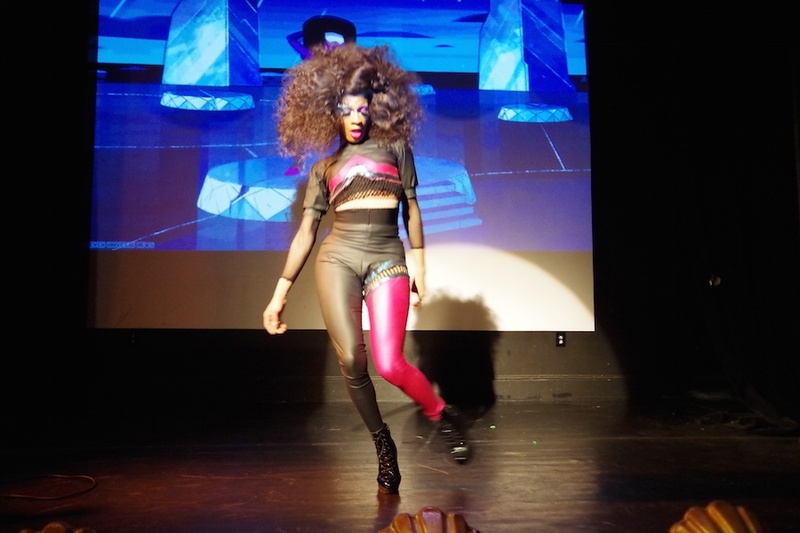 She donned a skin-tight outfit in black and magenta and a huge wig to play her favorite character, alternating the character’s lines with songs from the show, cat-walking across the stage and dancing through the aisles. “How was it you were able to get to the bottom of the ocean?” one of the characters on screen asked Garnet. For Kiki Lucia’s second performance, she took on the character “Him” from The Powerpuff Girls. In the cartoon, ‘Him’ is red all over with the pointed ears, nose and chin of a devil. He sports a pink tutu, alternately speaks in a high, sing-song voice and a low, gravelly tone, and is one of the show’s main villains. For her performance, Lucia wore the trademark pink tutu over a red leotard and applied bright red fingernails three-inches long. She wove dialogue from the cartoon with “Creep” by Radiohead and “Bad Blood” by Taylor Swift. She went down in the audience to lip-synch with the crowd, pulled a rubber ducky out of nowhere and spoke to it, and threw her tips at her own head. It was a madcap performance that also addressed the humanity of a complicated character. Mia E Z’lay performing as C.C. from Code Geass. For NHPC Director Patrick Dunn, the fundraiser was right on time. After stepping into his role in August of 2017, he has dedicated most of his waking hours to building new partnerships in the community, from political groups like the Party for Socialism and Liberation (PSL) to the Yale Divinity School to New Haven restaurants such as Barracuda Bar & Bistro and Olives & Oil. The New Haven Pride Center is open Tuesday through Thursday 3-6 p.m. with additional hours for affinity and support groups, events, and exhibitions. More information is available at the organization’s website. Supporters who couldn’t make the show can still donate through a GoFundMe that is still open. Video from the show is included below.